New work by Variable Projects is included in Drawing Codes: Experimental Protocols of Architectural Representation, opening January 17 at the Hubbell Street Galleries at California College of the Arts in San Francisco. Rotated Arcs, Seed 247/38, a robotic drawing from our Signal/Noise series, has been selected for the 4th Annual Juried Art Show at Piedmont Center for the Arts, in Piedmont, CA. Variable Projects has received an Honorable Mention for the 2016 Architect's Newspaper Best of Design Award for Young Architects. A drawing from our Ghosted Figures series has been selected for the group show "REJECTED: architectural drawings and their stories" at Team B in Cincinnati. Drawings from our After William Morris series are included in the recently published book Drawing Futures: Speculations in Contemporary Drawing for Art and Architecture, edited by Laura Allen and Luke Caspar Pearson, with Bob Sheil and Frédéric Migayrou. Glyphs, an experimental drawing project by Variable Projects, is featured in "Posthuman Frontiers: Data, Designers, and Cognitive Machines" — the juried exhibition accompanying the 2016 conference of the Association for Computer Aided Design in Architecture (ACADIA), hosted this year by University of Michigan's Taubman College of Architecture and Urban Planning. Sphere With Nested Figures, a sculptural object designed and fabricated by Variable Projects, is included in the juried group exhibition "Objects: The Secret Life of Buildings," opening October 17 at the Center for American Architecture and Design at the University of Texas at Austin School of Architecture. 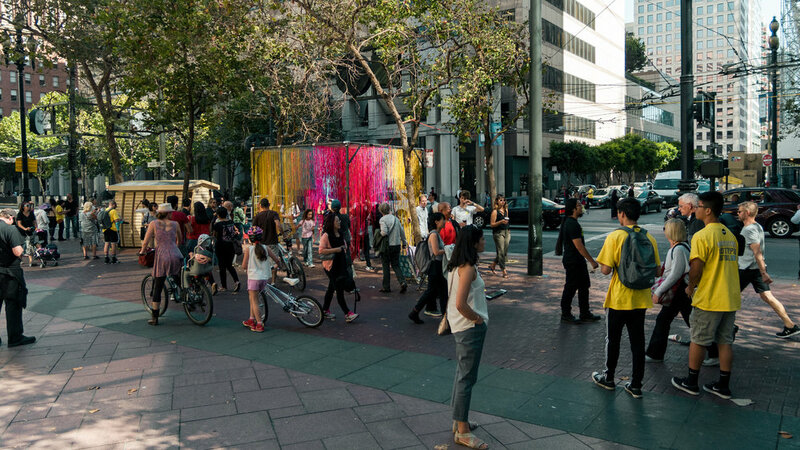 Glimmer, a new project by Variable Projects, debuted at the Market Street Prototyping Festival in San Francisco on October 6, 2016. Variable Projects has been selected to exhibit as part of the OBJECTS exhibition at the Center for American Architecture and Design at the University of Texas at Austin School of Architecture in October. 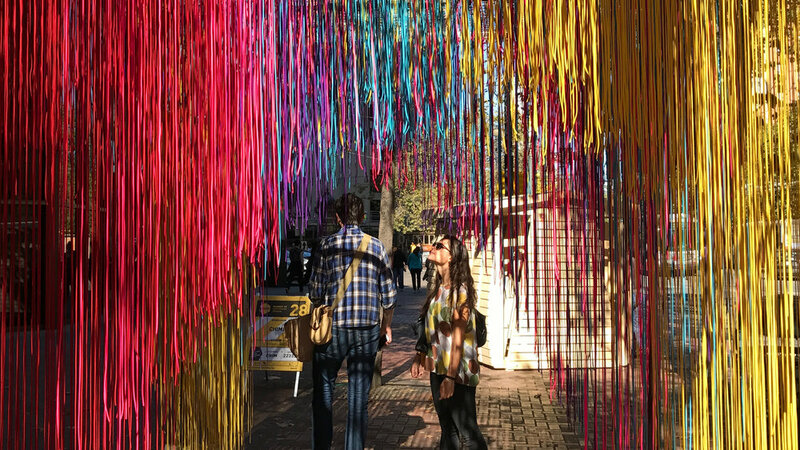 Glimmer, a dynamic public artwork designed by Variable Projects, has been selected for the 2016 Market Street Prototyping Festival. 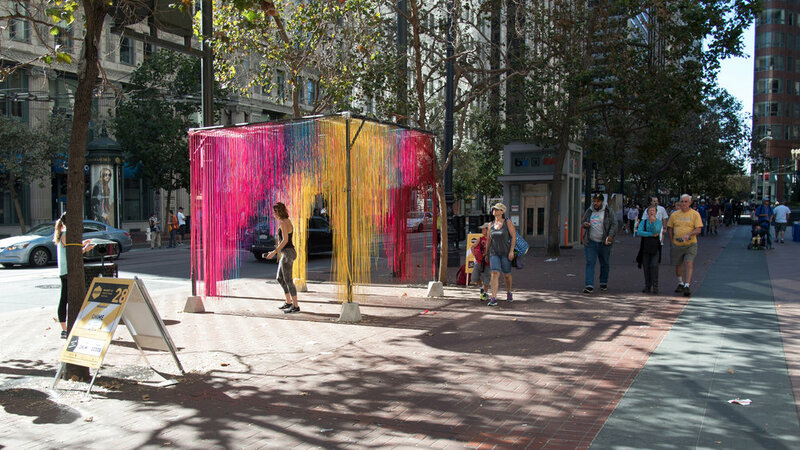 The project will be deployed on San Francisco's Market Street from October 6 - 8. Two drawings from Adam Marcus's Figures series have been selected for In_Sight On_Site: Beyond Function, a group show at the AIA San Francisco Gallery running from June 10 to July 28, 2016. Phase Change, a new dynamic public artwork by Futures North, to debut at Northern Spark 2016, an all-night arts festival in Minneapolis, Minnesota. On Friday, February 26, Adam Marcus will present a research paper at the 2016 National Conference on the Beginning Design Student at Cal Poly San Luis Obispo. Adam Marcus has been recognized by the Association of Collegiate Schools of Architecture (ACSA) and the American Institute of Architecture Students with a 2016 New Faculty Teaching Award. The award "recognizes demonstrated excellence in teaching performance during the formative years of an architectural teaching career." Architectural Record's January 2016 issue features Variable Projects as a "firm to watch" in an article by Anna Fixsen: "OK Computer: Bay Area firm Variable Projects leverages the digital to design for the human scale"
Work from the Buoyant Ecologies project, a multidisciplinary research initiative co-directed by Adam Marcus, Margaret Ikeda, and Evan Jones at California College of the Arts / Architecture Division, will be featured in two concurrent exhibitions as part of the 2015 AICAD Symposium: Exploring Science in the Studio.